WASHINGTON — When the roadside bomb detonated, it ripped through the fuel tank of the Bradley Fighting Vehicle and ignited like napalm. The seven men seated inside were knocked unconscious and had no chance to escape the fire. Cashe was the last of the injured to be evacuated from the scene. Doctors later said he suffered second and third degree burns over 90 percent of his body, but he still walked off the battlefield under his own power. He spent the next three weeks at Brooke Army Medical Center in San Antonio trying to recover as his men died one by one in adjoining rooms. Of the seven he helped evacuate, five could not survive the burns. Cashe’s family said that time was full of pain and grief for the platoon sergeant, his only consolation being that some of those Army brothers had the chance to say goodbye to their families. Cashe was the last from that battle to die. A week after he passed away, the Army awarded him the Silver Star, the third-highest combat military decoration a servicemember can receive for battlefield heroism. That was six years ago. Now, his family, his men, his commanders and veterans who never met Cashe want to know why this hero — a man who willingly embraced a painful, fiery death to save his fellow soldiers — has not been given the military’s highest award, and the recognition he deserves. They blame the military’s awards system, a confusing set of seemingly inconsistent rules and unofficial practices that they say, at least in Cashe’s case, have deprived a hero of his rightful recognition. Since 2001, only 10 men have received the Medal of Honor for actions in Iraq or Afghanistan, seven of them posthumous. Critics charge that the military has been stingy in handing out the honor, thereby denigrating the heroics of today’s troops. For comparison, there were 248 medals awarded during the Vietnam War. That war involved roughly twice as many troops as the current conflicts, but had nearly 25 times the number of top medals. Pentagon officials insist that today’s fighters aren’t held to a higher standard. But they do note that today’s battlefields are dramatically different than the close-range, hand-to-hand combat seen in previous conflicts. In a report released to Congress earlier this year, defense personnel officials wrote that technological advancements in weaponry and tactics have resulted in fewer “personal combat actions,” and in turn fewer battlefield heroics. But many doubt that claim. Doug Sterner, a military historian who has spent years pushing for better awards records, said that he has seen a “systemic failure” in how top military honors are bestowed in recent years. Last month, he petitioned the Secretary of the Army to review all Silver Star and Distinguished Service Cross awards from the last decade to determine whether military commanders are short-selling deserving heroes. Sterner said he was prompted to send the request after reading Cashe’s story and wondering how his actions did not warrant the Medal of Honor. He believes the low numbers aren’t attributable to stubbornness but instead ignorance of the medal process, and who should qualify. Receiving the Medal of Honor typically takes years. It requires approval from the hero’s service secretary and, ultimately, the president. Commanders who submit a name need multiple witnesses to attest to the valorous action, plus dozens of pages more documenting the battle. But awarding the Silver Star can be done by any general or flag officer and requires a small fraction of the work. Many of those honors can be turned around in a month or less, as Cashe’s was. Military commanders can request an upgrade of those awards later, and commanders involved in Cashe’s case have submitted paperwork asking for consideration of the Medal of Honor. But there’s no fast track for upgrading military honors, and though Cashe’s case was resubmitted in May, the Army has yet to take any action. Cashe was the youngest of 10 children, born in an impoverished neighborhood just outside Orlando, Fla. His father died when he was 5, and White said his troubles with teachers and law enforcement escalated as he grew up. But instead of a tragic downfall, his family boasts of his story as “a poor boy from the projects who made good.” He joined the Army after struggling through high school. His mother objected, but Cashe knew it was where he belonged. Charles Jones, who served with Cashe for four years before his death, said he was a prototypical platoon sergeant — demanding but fair, always working alongside his men rather than issuing orders from the rear. At 35, he was one of the old men of the 1st Battalion, 15th Infantry Regiment, both a role model and friend for many of the younger soldiers. Jones said the two bonded over fishing shortly after they met and shared numerous fishing trips in between military duties. Jon-Ray Falgout, who was a young private when the 1-15 deployed to Iraq in 2005, remembers Cashe as a tough guy who liked to laugh. “He didn’t expect any more out of you than he was willing to do, but he didn’t expect any less either,” Falgout said. 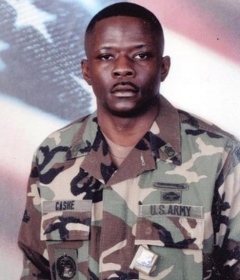 Cashe met his wife, Tamara, in the service, and had three children before the Sept. 11, 2001, attacks. Relatives said they knew he’d be among the first to volunteer for combat overseas. White remembers chastising him before his unit left for Iraq in early 2005, telling him “not to be a hero” and to come home safe. “He had always said he would never leave one of his boys behind,” she said. The Bradley attack that took Cashe’s life happened Oct. 17, 2005. By then, Jones said, their battalion had lost too many soldiers to roadside bombs and sniper fire. Soldiers who served with Cashe said that attack was the low point of their tour, both for the lives lost and the gruesomeness of the injuries. Jones said he saw one of his best friends, Staff Sgt. George Alexander, being readied for a medevac flight out. His wounds were so severe Jones could barely recognize him. When Jones reached for his hand, his burnt skin flaked off. “I still have nightmares about that,” he said. Alexander died on Oct. 22, 2005, five days after the explosion. The troops were immediately awed by reports of Cashe’s heroism. Battlefield narratives describe Cashe’s uniform and skin on fire for about five minutes while he pulled his men from the vehicle. At one point, another soldier had to extinguish the blaze on Cashe’s back so the platoon sergeant could continue tending to the wounded men. None of the burn victims looked like they would survive, but Cashe’s troops and family believed that somehow he would beat the odds. If he could endure the pain of walking through fire again and again, he could find a way to recover. White said she never believed her brother would die until just hours before he passed. His body was broken but his spirit was not. Throughout the three weeks at Brooke Army Medical Center, he kept asking for updates on the men he pulled from the Bradley and the ones still fighting in Iraq. At least initially, that last part — “in action against an enemy” — is what kept Cashe from being considered for the Medal of Honor. Harry Conner, a friend of White’s family who has helped in the push for upgrading Cashe’s award, said initial battlefield reports did not include details about small-arms fire from insurgents peppering the Bradley as Cashe tried to rescue his men. The distinction of heroism away from the “battlefield” — a roadside bomb explosion isn’t considered an active battlefield for medal purposes — left commanders in Cashe’s unit to push for the Silver Star instead of a higher award. But that wasn’t the only factor. Sterner said that raises the question of whether commanders have been self-regulating the valor medals, aiming low because of an internal perception that nearly no actions are worthy of the Medal of Honor. “If running into a burning Bradley over and over again isn’t worth the Medal of Honor, I don’t know what is,” he said. Col. Gary Brito, Cashe’s battalion commander at the time, said he knew little of the awards process when he recommended Cashe for the Silver Star. His focus was on keeping his men alive and focused following that latest spate of deaths. It wasn’t until months later, after he returned from Iraq, that the lesser honor started to gnaw at him. He’s now leading the push to get Cashe’s honor upgraded. In a memo advocating an upgrade to the award, Brigadier Gen. Steve Salazar, the brigade commander in 2005, wrote that Cashe “consciously, deliberately, willingly subjected himself to the excruciating pain and suffering of flame and smoke to save his soldiers and continue the mission. I know no braver, selfless act.” Soldiers who served with Cashe echoed that sentiment, saying that a Medal of Honor for his bravery would bring greater recognition to his heroism.